The following article was posted last March. A few weeks ago the 4th Street Rain Garden was finally restored, thanks to the City of Annapolis. So, one BMP restored; several tens of thousands in the Chesapeake watershed to go. Restoring the Bay is dependent upon keeping thousands of Best Management Practices (BMPs) working. The following article illustrates why this task cannot be accomplished without a tremendous increase in public participation. It shows how even the most dedicated agencies cannot cope with a tremendous workload. It also shows how even the most Bay-knowledgeable among us are not aware of this need, which speaks loudly to the need for better public education. storage depression remains. Do these simple things and you get 70% – 95% pollutant removal from all runoff entering the Rain Garden. 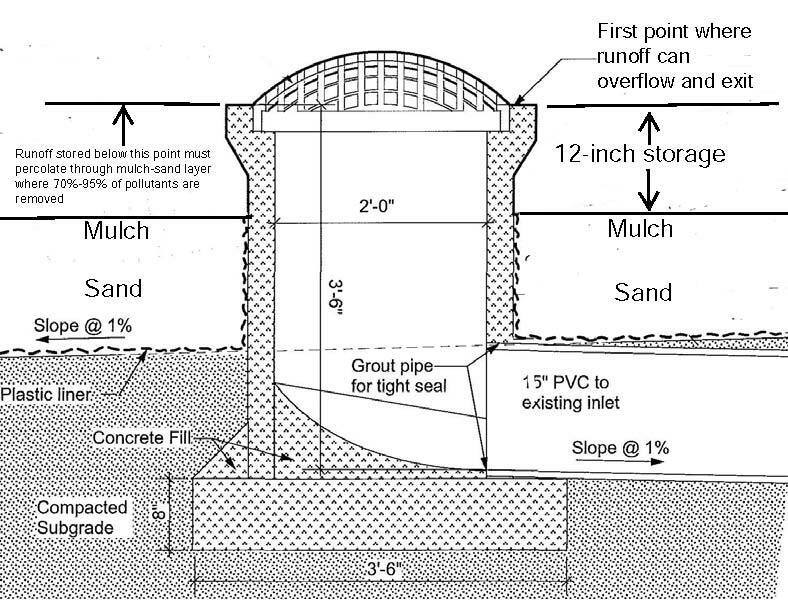 And with a 12-inch depression a Rain Garden can treat 90% of all the runoff from the half-acre or so of streets and other impervious surfaces draining to the BMP. For the first few years after installation of the 4th Street Rain Garden volunteers took care of maintenance. But somewhere along the line the City of Annapolis assumed the maintenance responsibility. I first saw the 4th Street Rain Garden last November. I found it was in serious need of maintenance and alerted City officials. The critical 12-inch surface storage had dropped to zero along with pollutant removal. This storage area holds the first inch of runoff from 4th Street until it can soak down through the mulch and underlying soil. It is this downward movement through mulch and soil where the 70-95% pollutant removal occurs. With zero storage pollutant retention had dropped to zero as well! A month went by with no response from the City. So I wrote to the City Manager which generated a pretty quick response. A week later I received an email from the City stating the Rain Garden had been cleaned. Yet when I looked at it a few days later there was no change other than more mulch had been added. This indicated the City personnel would benefit from additional education with regard to BMP maintenance. I pointed this out to the City and was assured repairs would be made once they located the plans for the facility. Nevertheless, the City guaranteed that the facility would be fully restored once warmer weather came. I since obtained the plans from Jim Urban who designed this very creative and very attractive facility. As of March 16th – five months since I first began the effort to get the Rain Garden repaired – it remains much as I first found it. During the interim five months of polluted runoff have needlessly washed into Spa Creek, the Severn River and the Chesapeake Bay because a couple hours of work had not been performed. Part of the irony is that the 4th Street Rain Garden is located next to some of the leading organizations in the Chesapeake Bay restoration effort, including the USEPA Chesapeake Bay Program, the National Park Service, the Keith Campbell Foundation, the TKF Foundation, and the Conservation Fund. By irony I mean that the employees of these organizations are among the most knowledgeable and dedicated when it comes to Bay restoration. In other words, these would be the first people to look for problem BMPs had they been exposed to effective educational materials. The fact that no one had contacted the City about this failing Rain Garden says that existing education efforts are woefully inadequate. It would be wrong to harshly criticize the City of Annapolis for failing to maintain this and other BMPs. Until stormwater fees recently came into being, funds for BMP maintenance, training personnel and other essential tasks were stretched incredibly thin. It would also be wrong to point fingers at Chesapeake Bay Program staff and others who probably lunch next to this facility on nice days. If even these ultra-Bay conscious people are not aware of how to identify and correct BMP maintenance problems, then this, again, speaks volumes about the need to greatly expand public education efforts. 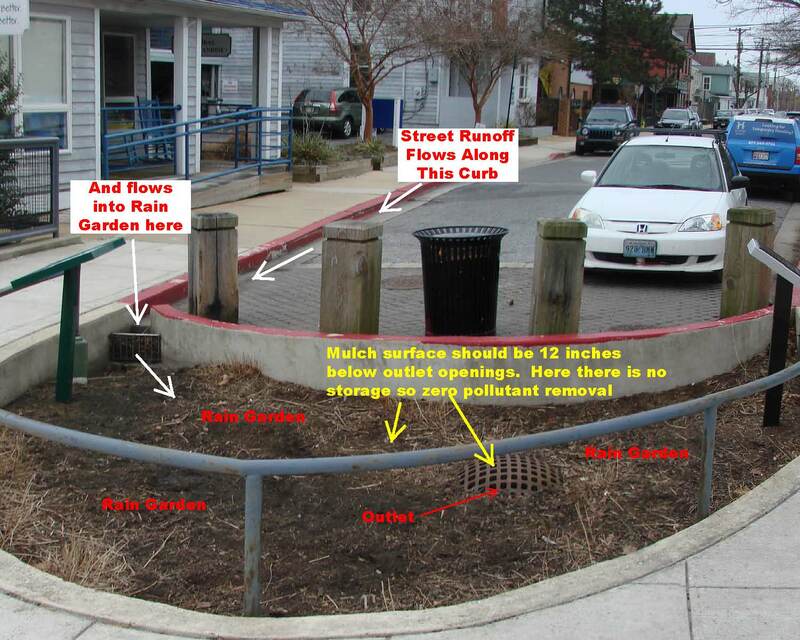 The 4th Street Rain Garden is one of about 100,000 stormwater BMPs throughout the Chesapeake Bay watershed. These BMPs could be keeping a tremendous amount of pollution out of the Bay. But indications are that a significant number have failed due to poor maintenance, just like the 4th Street Rain Garden. This problem is now assuming an even greater level of urgency. We are about to see an explosion in the number of Rain Garden type BMPs throughout the Chesapeake Bay watershed. We are counting on these BMPs to hold the line on nutrients and other pollutants from new development. And new development is the only source of Bay pollution which is still growing. Today we lack the government inspectors needed to keep existing BMPs well maintained. This task will become even more impossible for government alone in the coming decades. The only approach which may keep all these facilities working is to vastly increase the number of volunteer eyes watching for BMP maintenance needs and even performing routine repairs. This is something that can and must be done by working cooperatively with BMP owners and government agencies. In fact, the City of Annapolis said they’d be delighted to work with volunteers interested in maintaining the 4th Street facility and other BMPs. To accomplish this task we must make it clear to the public that restoration of the Chesapeake Bay and the waters closest to their homes WILL NOT happen without their active involvement. We must then ramp up our public education effort and urge citizens to do something like Adopt-A-BMP. We can only restore the Bay and the waters nearest your home with your active support. It’s no longer enough to contribute dollars, write the occasional email or sign a petition. Part of this more active support must include actions such as checking out the BMPs which serve the supermarket where you shop, the building where you work and the neighborhood you call home. A sign should be erected next to each BMP explaining the benefits it provides, how to determine if it needs maintenance and who to call to report problems. The sign must also clearly state the need for volunteers to lend a hand. Fortunately most BMP maintenance is about as easy and fun as backyard gardening. For further detail on Rain Gardens see: CEDS Rain Garden factsheet and Rain Gardens Across Maryland. With regard to locating, evaluating and getting other stormwater BMPs maintained see: Auditing Chesapeake Bay Watershed Stormwater Best Management Practices and a 30-minute narrated presentation on YouTube. If you’d like to start something like an Adopt-A-BMP effort in your area then please contact me (Richard Klein) at 410-654-3021 or Rklein@ceds.org. Thanks, Richard. I have seen similar situations elsewhere in the state where raingardens are installed but then not really maintained. One aspect of the problem is that there is often money for installation of projects but not always money for the long term upkeep. I like your idea of improved signage. I would add that the sign should always give instructions for how that exact garden should be maintained. Over time, the legacy of “how to do it” or “how it was designed” is often lost or distorted (I picture people searching closets for blueprints, searching on line for long dead websites, etc before giving up and just throwing down pansies in these spots). A permanent sign with how-tos that are laid out in specific step-by-step directions would be a simple and easy way to would ensure that even the most untrained volunteer could follow directions for maintenance when needed. We need to reach the all of the people who are carrying the shovels in our municipal offices and along our suburban streets, be they volunteers or paid staff. They are all essential to the success of these efforts.